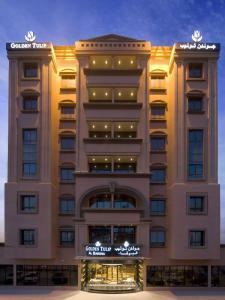 Golden Tulip Al Barsha is situated a few blocks away from the renowned Mall of the Emirates and Ski Dubai and within easy reach from Dubai International Airport, the Exhibition Centre, Dubai Metro and Jebel Ali Free Zone. With a stylish interior design concept and decor, the Golden Tulip Al Barsha adds up another milestone in quality four star hotels in the region, offering all that is required by the business community and the leisure traveler. 3 multifunctional, fully equipped meeting rooms, situated on the first floor for – corporate events – meetings – cocktail receptions – celebrations – seminars Maximum capacity of 100 guests.